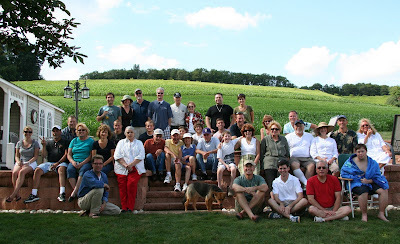 we returned last night from a long weekend in pennsylvania to attend my extended family's annual summer gathering. what a great time - we missed the last couple years so this year was particularly sweet! weather wise we could not have ordered better weather. saturday was spent with the family at my cousin and her husband's farm. this was the first year the picnic has been here and what an idyllic location - I hope this will be just the first of many years at this location. sunday we celebrated my birthday by taking the long way home to cleveland - soaking in all the summer loveliness and exploring a part of central pennsylvania I never visited before. 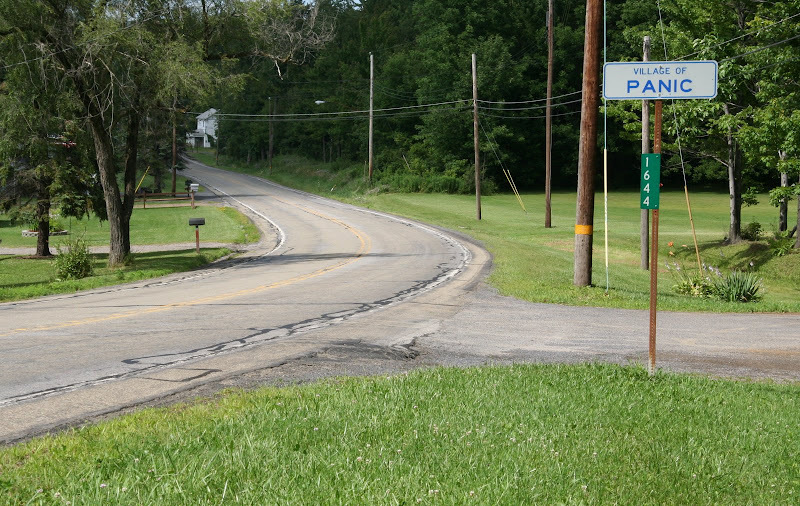 I'm intrigued by towns with peculiar names and we were able to go through quite a few uniquely named towns and villages, including paradise, desire, stump creek, and panic. let me say, however, despite the name, the denizens of panic seems quite laid back. to see a few snaps of our wanders click here. today's theme song is by the oysterband, a group I have adored for a couple decades. over the years the group has featured a variety of talented musicians - but alan prosser and ian telfer have been constants. years back they used to tour the u.s. and I had the good fortune of seeing them a few times when they played at the iron horse music hall in northampton mass - one great place to hear music, gosh I miss that place! my favorite concert was when the boys played with june tabor - now there is a match made in heaven. in 1990 they released an album together - freedom and rain - which remains in my top ten recordings of all time. in fact I had hoped to have posted the song pain or paradise from that album as today's theme song - but alas I couldn't find a vid of it on the internet. but that's cool as everywhere I go is everybit as compelling and infectious as pain or paradise! The Village of Panic is a long way from Normal (Illinois). But the photo of the approach to Panic...I have seen that film (Oh, your car fell into a pothole? You're going to have to stay here, mister -takes three days to get parts. ), and it didn't end well. Oregon had some good ones too - Bend and Weed, for instance. I started watching the ovie Panic last night, but someone had to wath kids TV, so I'm not through it. As for families being God's gift, I often think it would be nice to regift some of them. Do you suppose God kept the receipt? Ok, I'm a musician who hadn't heard "Everywhere I Go" or the Oysterband. I confess it. It becomes chant like doesn't it? i hope you find the other song soon and post it as well. You're always teaching me, Mouse! Thank you for that! Wow, not just Panic, but Lofty & Desire too. Great pix on Flickr. Happy Birthday, late! I like Merle's idea. We could hold a raffle. Hm... might have to force people to buy tickets though. Let me think this one out. i agree with R.L.S....time for a road trip! I'd never heard of the Oysterband before; these guys are good! And quite an eclectic lineup of instruments, including cello and Uillean pipes. It all adds up to a unique sound (although the lead singer does sound an awfu lot like Michael Stipe). And a happy belated birthday! I hope that wander down the back roads started your new year off right. Road trips are fun. Yay! junk - geez all those times driving through illinois and I still haven't gone through normal! sparkey - will definitely have to check out weed! bend is BEAUTIFUL - been there a couple times and am shooting for a trip to oregon next summer for the sisters quilt show, in sisters oregon - another GREAT town name! chris - happy to hear I can turn a musician on to a new tune and a new group! I saw on the boys website they are coming to a few places in canada this summer, but unfortunately not toronto or any place relatively nearby....they are AMAZING LIVE.... I do have a terrible weakness for a rocking fiddle and also the squeezebox! mum - my family is quite into raffles - in fact we just had a 50-50 at the reunion on saturday! tom - in my book it's always time for a road trip!! dot-com - you are the queen of road trips!! We didn't have a fifth of your turnout, but we enjoyed our family gathering this weekend, too. I come by here once in while to look at all the purty pics, and here's hoping my birthday twin (YOU) had a great day, which it looks as though you did! YAY! Ah The Iron Horse! I saw Bob Weir there once!